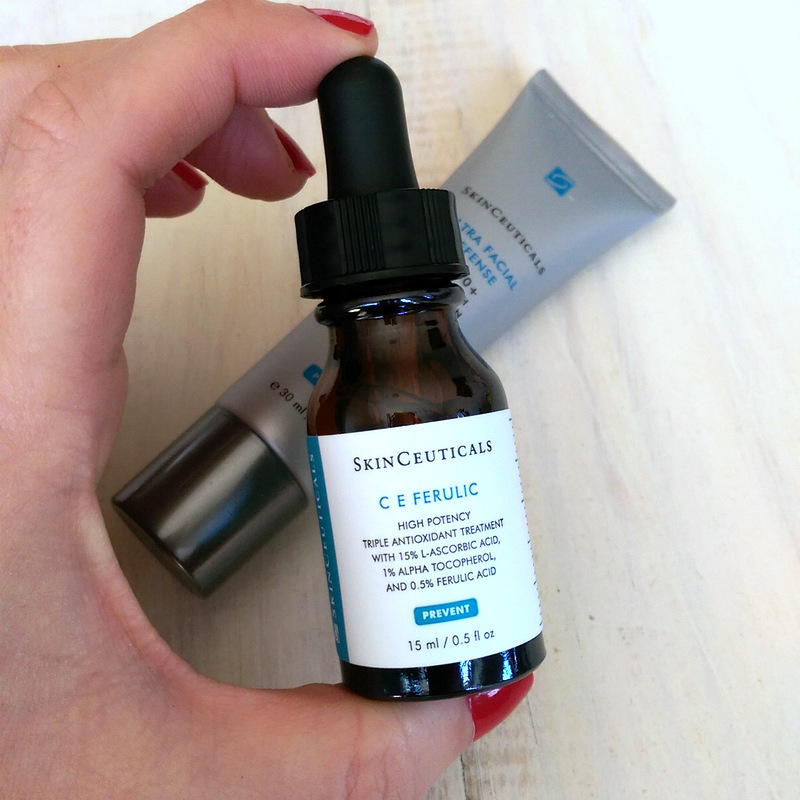 A while back SkinCeuticals sent me their C E Ferulic High Potency triple antioxidant treatment (R2 130) and I didn’t feature it on the blog as I thought I’d already reviewed it but have recently come to realise I actually featured another of their serums, Reservatrol B E. Oops! Anyway, while I liked their Reservatrol serum, I didn’t think it justified its high price point but C E Ferulic treatment, while also ‘not cheap’, is worth the splurge if you can afford it. Again, this is an antioxidant serum but it contains a whopping 15% vitamin C! Better yet, the vitamin C’s been teamed with vitamin E (listed as ‘alpha tocopherol’ – a very easy to absorb form of the vitamin) which has been proven to boost its efficacy further. (C is your fire and E is your gasoline!) It then get better… Ferulic acid, a powerful antioxidant plant extract, is also in the mix and helps stabilise the C and E, super charging their power even further! Much like vitamin E, vitamin C is a fab free radical scavenger, but is also proven to boost collagen production as well as minimise the look of pigmentation. Many products that contain it can thus legally get away with saying ‘contains collagen-boosting vitamin C’ but here’s the kicker – the minuscule amounts they contain aren’t likely to have any effect. Skinceuticals, however, have seriously pumped up the jam so you really are going to get results. In fact, now that I’ve gotten back from a beach holiday and have two mild pigmentation patches under each eye, this is the product I’ll be adding to my skin care routine so as to send ’em back to hell. Another plus? According to SkinCeuticals, when you team this serum with your sunscreen it can improve its photo protection factor by up to eight times while offering up to 96% free radical protection. P.S. If you’re also struggling with pigmentation right now and can’t afford to part with over R2K please don’t shed a tear. SkinCeuticals’ treatment is a fabulous one but by no means the only one that can sort you out. Environ, for example, have a very well priced vitamin C cream called Evenescence C-Boost (R355). I can’t figure out the vitamin C percentage but it sits at number two (after ‘water’) on the ingredients list so I know it’s pretty darn high. It also contains vitamin E and has successfully helped blitz post-holiday pigmentation I’ve experienced in the past. You are the absolute best for giving us alternatives if we are strapped for cash. BEEG Hugs! Gosh Leigh! Tell me about it. Thanks for helping in this way. Appreciate your raw honesty. I don’t see this product from Skin Ceuticals anymore. Is this being taken off the shelf? I found another one, CE Ferulic Combination. Are they the same? Hi Elaine! Sorry for the slow reply. I’ve just seen your comment now. To my knowledge they’re the same product.